Are wasps a bigger problem this summer? Wasp nests are keeping pest controllers five times as busy across the UK, according to experts. "Pest controllers usually remove two to three nests a day but at the moment our members are being called to deal with 10 to 15 a day," said Natalie Bungay, technical officer at the British Pest Control Association (BPCA).Search interest in the word "wasp" in the UK was the highest in five years between 5 and 11 August, according to Google Trends.And the hashtag #wasps is winging its way around social media as people share their sting stories. Henry Haigh, 19, from Riseholme, Lincolnshire, tweeted pictures of his dog Wilson, which was stung on the mouth. Abbiemay Pedersen, 25, from Binbrook in Lincolnshire, said she had "definitely" noticed more wasps around during this summer's heatwave. 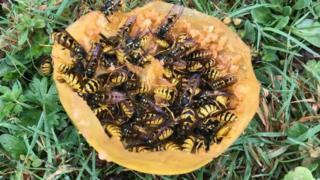 "We have chickens and I always throw out a few apples for them but on Tuesday we had an invasion of wasps. It was crazy," she said. Telford and Wrekin Council is among authorities that have noted a rise in the amount of calls about wasps.But it advised councils could not get involved in wasp removal unless the infestation was on open public land, so if you have a wasp nest in your home or garden you must call in the professionals. Why are there wasps in my bathroom? What's really the point of wasps? Supplies of a leading chemical used to get rid of wasp nests in Britain are running perilously low due to unprecedented demand, according to the Huffington Post.Wasp numbers traditionally rise and fall in a two-year pattern, according to the BPCA.Its records show the UK was inundated in 2016, followed by a distinct lull in numbers in 2017.The summer heatwave may have added to the rise in numbers in 2018 because the warm conditions ripen fruit and flowers earlier, it said. Fertilised queen wasps emerge from hibernation and start working on new nests in the spring as the weather gets warmer, said the BPCA's Ms Bungay.By the summer months up to 300 eggs are produced every day and up to 5,000 adult wasps work to feed grubs and build the nest structure. "This early abundance of fruit in the fields and gardens gives better feeding conditions in which they can thrive," said Kevin Higgins, also from the BPCA. "Wasps get giddy on the fruit, it makes them slightly inebriated, and this is when they are most likely to sting. "Wasps do not die after one sting - they can, and will, sting you quite a few times, he said. "If this weather continues, the wasp season will extend, and that could mean a bumper year for 2019, as conditions allow for more queens to thrive in the nests," Mr Higgins added. Do not try to tackle a wasps nest yourself - contact a professional pest controller. What have you always wondered about that you would like the BBC to investigate? Use the form below to ask us your questions and we could be in touch. » What's really the point of wasps?